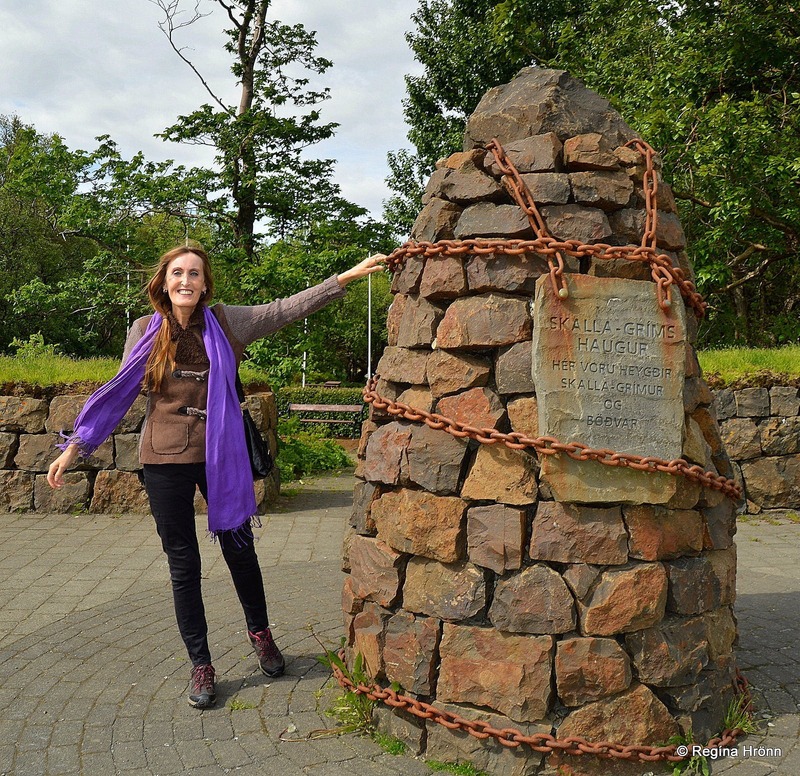 Have you visited the 9 cairns from the Saga of the Viking Egill Skallagrímsson? Borgarnes in West-Iceland (pop. ca 1,800) was the home of one of the settlers in Iceland, Skalla-Grímur Kveldúlfsson and his rascal son Egill, who was raised at Borg at Mýrar, just outside of Borgarnes town. 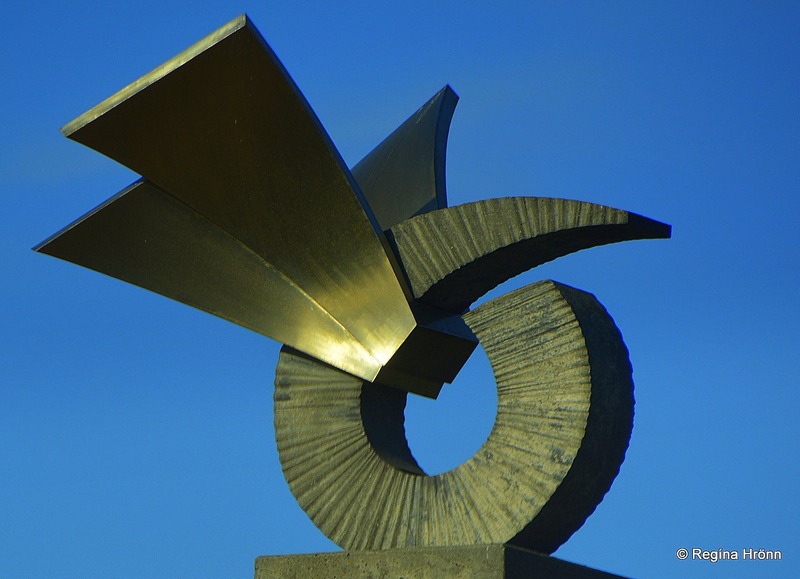 In Borgarnes town you will find the award-winning Settlement Centre in two of the oldest building in Borgarnes, with excellent exhibitions on the settlement of Iceland and the Saga of Egill, which is amongst the best known Icelandic Sagas. 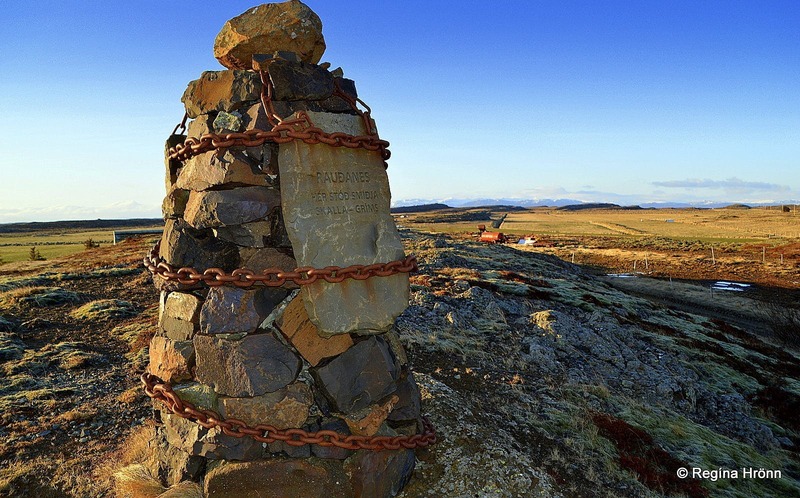 And both in Borgarnes and in the surrounding areas you can go on a cairn-hunt, as the curators of the Settlement Centre, Kjartan Ragnarsson and Sigríður Margrét Guðmundsdóttir, have erected 9 cairns at important locations from the Saga of Egill. There are two exhibitions at the Settlement Centre; one of them is on the settlement of Iceland in 874 (give or take a few years) until the establishment of Alþingi, the old Viking Parliament in 930 - and the other exhibition is on the life of the Viking Egill Skallagrímsson from the Saga of Egill, both of them equally interesting. Skalla-Grímur Kveldúlfsson was one of the Norwegian settlers in Iceland, who sailed from Norway with his father Kveld-Úlfur. Kveld-Úlfur got ill on the way and died. Before he died he ordered his son, Skalla-Grímur, to take up habitation in Iceland where Kveld-Úlfur's coffin would land. The coffin landed in Borgarnes and there Skalla-Grímur made a home at Borg in Mýrar just outside of Borgarnes. His son was Egill Skallagrímsson (910-990), one of the best known Vikings and poets at this time. 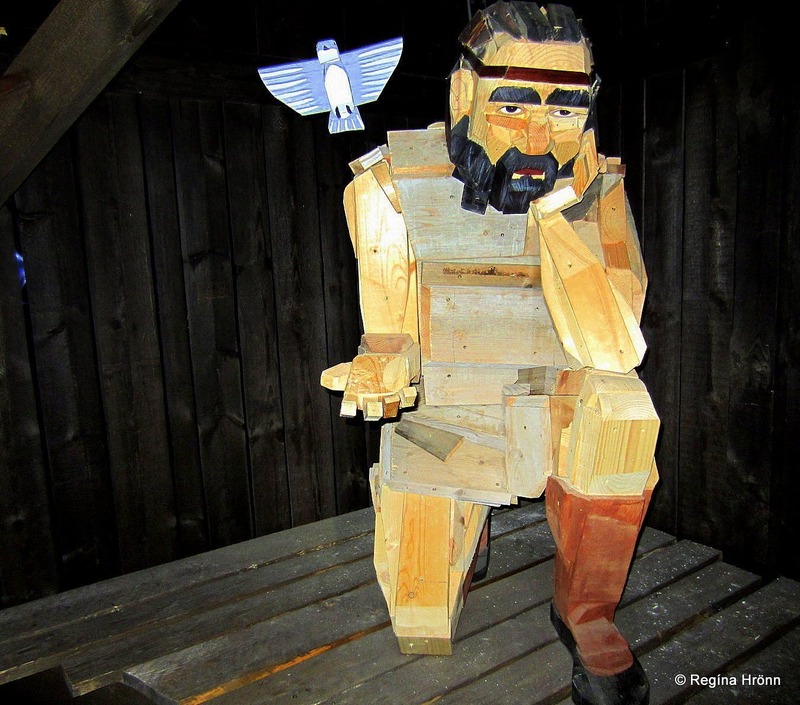 His story is depicted in the Saga of Egill. I read the Saga of Egill in college, so visiting the Settlement Centre was a good revision. The exhibition is excellent and makes for a very interesting visit. 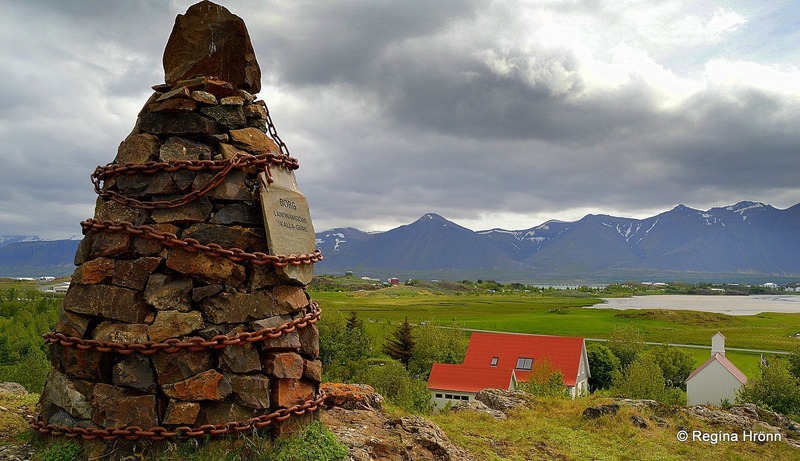 At the Settlement Centre you can learn all about Egill Skallagrímsson and his story, but reading the Saga of Egill is strongly recommended as well to benefit the most from your visit. You can also download the app Locatify and listen to it before you arrive. The Settlement Exhibition depicts the settlement of Iceland from around 874 until the establishment of Alþingi, the old Parliament which the Vikings established back in 930. 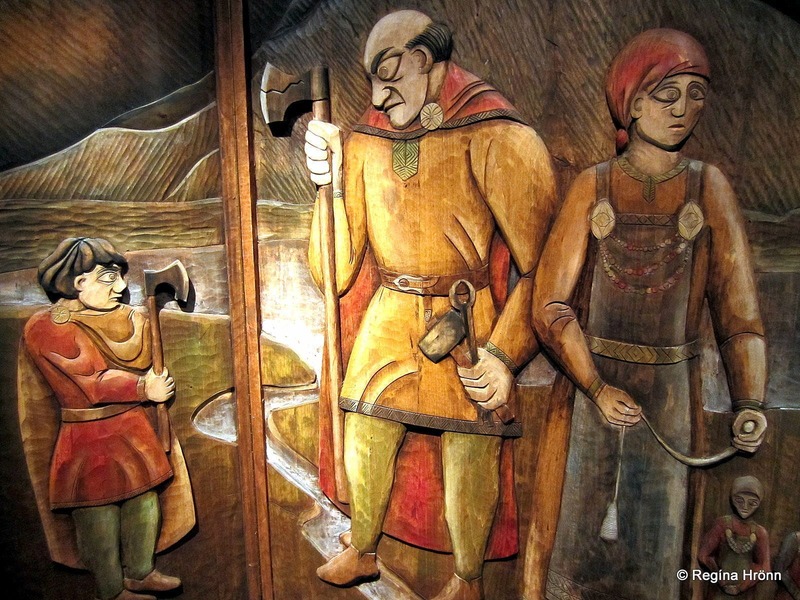 It tells the story of the Norwegian Vikings who settled Iceland and why they left Norway. And why our Icelandic heritage is not only Norwegian but also Irish. 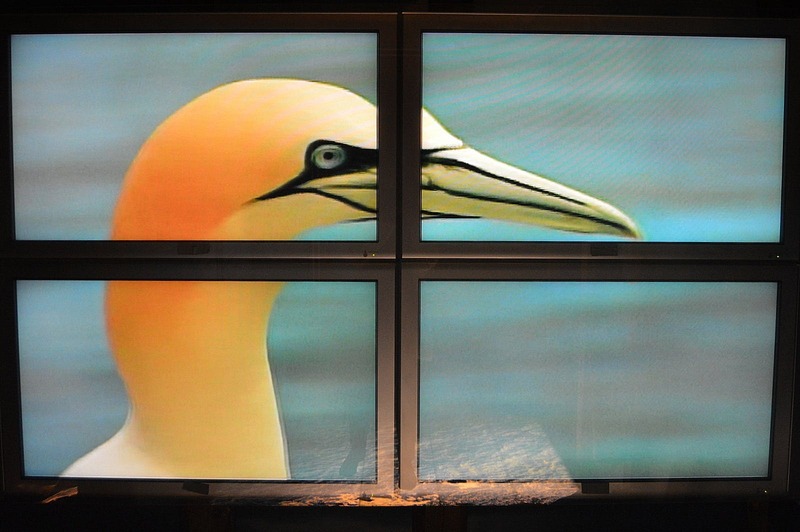 It is a very interesting exhibition, which takes some 30 minutes to complete with an audio guide. I recommend that you visit both these exhibitions and grab something to eat at the restaurant at the Settlement Centre before you check out the locations of the cairns. Open daily from 10 am-9 pm. Now let's go on a treasure hunt and look for all the 9 cairns! Cairn no. 1 is located at Granastaðir - Grani's Farm, above the camping area in Borgarnes, by ring-road 1. Grani was a crew-member on Skalla-Grímur Kveldúlfsson's ship and settled at Granastaðir. Egill Skallagrímsson was born at the close-by Borg, but his childhood playmate, Þórður Granason, grew up at Granastaðir farm. Here in Sandvík the ill-fated ball game between Egill and Þórður in one team, and Skalla-Grímur in another team, took place. You can read this account in the Saga of Egill, chapter 40. Below I have written a description of the game, which led to the death of both Þórður and the bond-maid of Skalla-Grímur. Cairn no. 2 is located at Brákarsund Strait and written on it in Icelandic is "Hér drekkti Skalla-Grímur Brák" meaning that Skalla-Grímur drowned Brák at this location. Skalla-Grímur Kveldúlfsson had a bond-maid named Þorgerður Brák. She had been the nanny and foster-mother to Egill, the son of Skalla-Grímur, and is described as big and strong as a man and skilled in magical arts. One day in the winter time when Egill was 12 years old Skalla-Grímur was playing a ball-game at Borg with Egill and his friend, Þórður Granason. At first the boys were winning, but later on, in the evening Skalla-Grímur got really strong and grabbed Þórður and tossed him onto the ground with such force that Þórður died. He then went after his own son, Egill. Þorgerður Brák was watching the game and said: "Hamask þú nú, Skalla-Grímr, at syni þínum". It roughly translated means if Skalla-Grímur is now going to attack his own son. Skalla-Grímur got so angry that he let loose Egill and tried to grab Þorgerður Brák, but she ran. Skalla-Grímur chased her down to the sea where she jumped from a cliff into the sea and tried to reach the island outside of Borgarnes, now called Brákarey island. Skalla-Grímur threw a big rock at her with such great force that Þorgerður Brák didn't resurface. Since that time the strait where she drowned is called Brákarsund - Brákar strait. 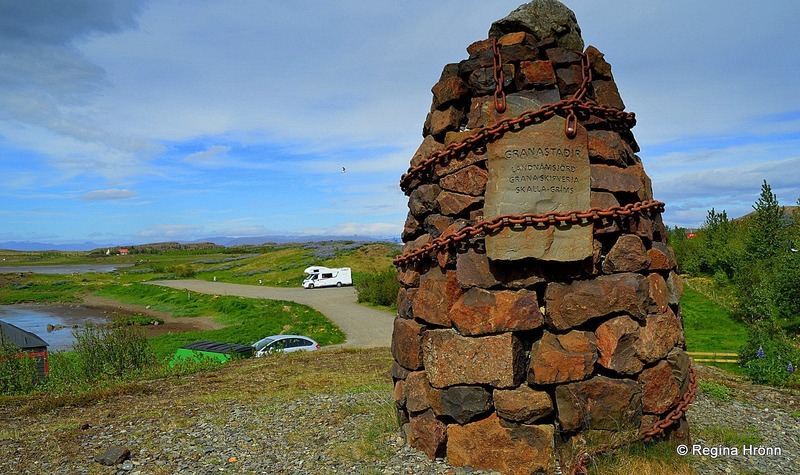 The monument Brákin stands tall on the hill above the Settlement Centre in remembrance of Þorgerður Brák and her ill fate. Brákarey island is off the shore of Borgarnes and is now connected to land by a bridge. The island was named after Þorgerður Brák and so is the street Brákarbraut where she ran while trying to escape from the mad Skalla-Grímur. You can visit cairn no. 2 and the monument by Brákarbraut just behind the Settlement Centre. Cairn no. 3 is located by Skalla-Grímshaugur - Skalla-Grím's Burial-Mound. On it is written in Icelandic "Hér voru heygðir Skalla-Grímur og Böðvar" meaning that Skalla-Grímur and Böðvar were buried here. 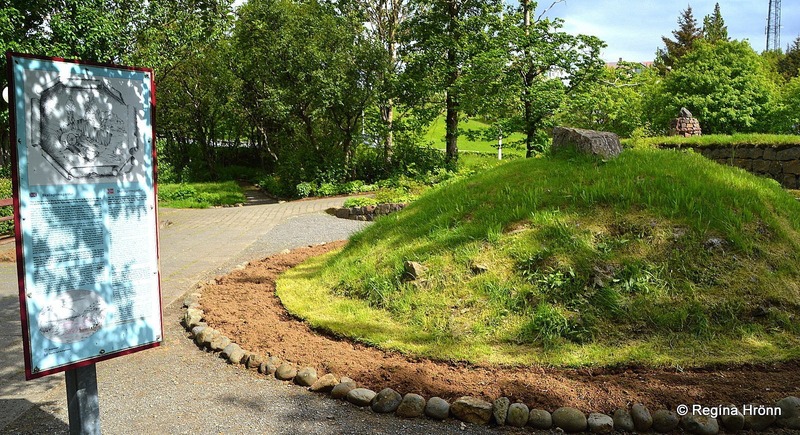 Here you will find the burial-mound of Skalla-Grímur Kveldúlfsson and his grandson Böðvar, the son of Egill Skallagrímsson. Egill had the burial-mound of his father reopened and buried Böðvar, who was only a teenager when he drowned in Hvítá river, in the burial-mound with his grandfather. Skalla-Grímur had died of an unknown disease and drawings by the mound show how he was buried with his horse and weapons and tools. An ornamental park is built around the mound, with a beautiful relief of grief-struck Egill Skallagrímsson carrying his drowned son Böðvar home on a horse, an astounding work by Anne-Marie Carl-Nielsen, which was donated to Iceland in 1963. 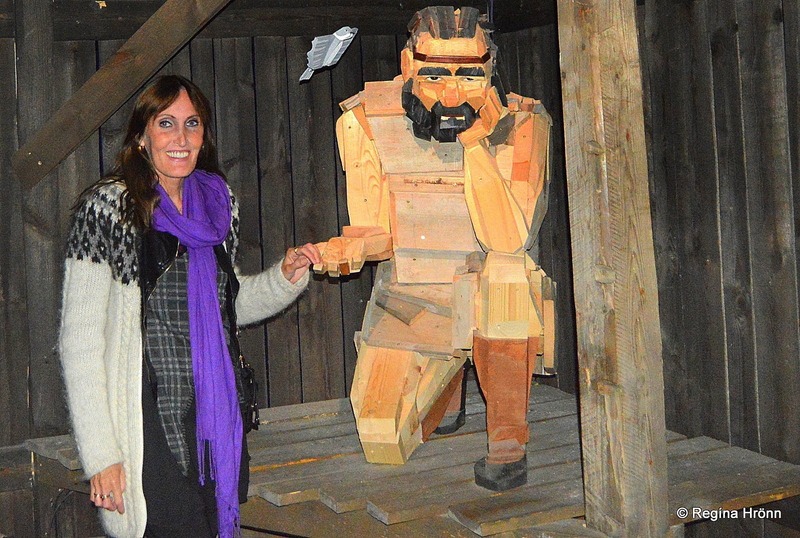 Visiting the ornamental park is a must when visiting Borgarnes. Skalla-Grímur's Burial-Mound and cairn no. 3 are located in the centre of Borgarnes town. Cairn no. 4 is located at Borg at Mýrar. The Norwegian Vikings Skalla-Grímur and his father Kveld-Úlfur sailed from Norway together in separate Viking ships to Iceland. As I have mentioned earlier then Kveld-Úlfur, the father of Skalla-Grímur, died on his way over to Iceland. He had a coffin made before he died and ordered his son to settle land in Iceland where his coffin would land. Kveld-Úlfur's coffin landed in Borgarnes and Skalla-Grímur settled in Borgarfjörður, and built a home at Borg at Mýrar. His son, Egill Skallagrímsson, lived at Borg after Skalla-Grímur died. On top of a cliff above Borg stands one of the 9 cairns. A trail from the left side of the church leads up to the cairn. Borg is actually named after this cliff, as the Icelandic word "borg" can mean both city and a rocky hill. There has been a church at Borg since 1003, but the current church dates back to 1880. 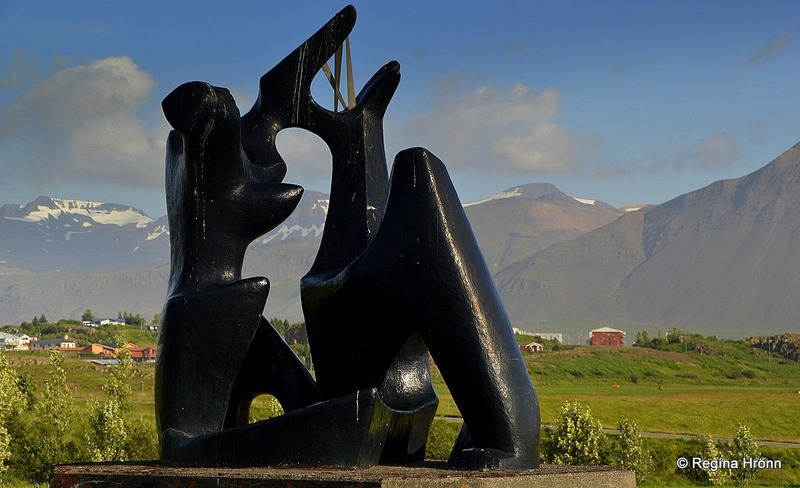 By Borg stands a prominent black sculpture by the noted Icelandic sculptor Ásmundur Sveinsson, Sonartorrek, named after the poem Egill Skallagríms-son wrote when he lost his 2 sons. Another prominent Icelander lived in the 13th century (from 1202-1206) at Borg - the Chieftain and influential writer, Snorri Sturluson, who is believed to have written the Saga of Egill. One of the main characters of the Saga of Laxdæla, Kjartan Ólafsson, is buried in the graveyard at Borg. A gravestone with runic writings marks his ancient grave. Borg stands north of Borgarnes by the intersection of ring-road 1 and road 54 leading to the Snæfellsnes peninsula. Coming from Borgarnes on ring-road 1 turn left on road 54. On your right-hand side, you will see Borg. Cairn no. 5 can be found right by the farm at Rauðanes - Bog Iron Peninsula. Written on it in Icelandic is "Hér stóð smiðja Skalla-Gríms" meaning that here Skalla-Grímur built a smithy. 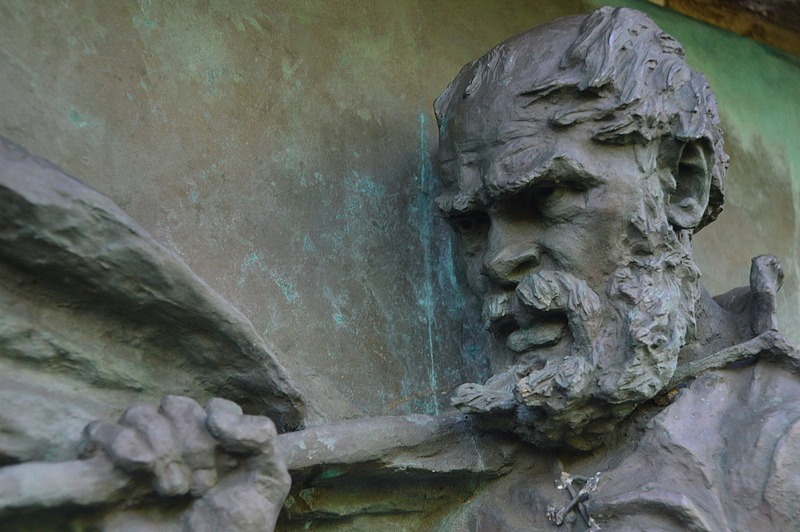 Skalla-Grímur is described as having been a very skilful iron-smith in the 30th chapter of the Saga of Egill. Here in the peat bogs at Rauðanes peninsula Skalla-Grímur found bog iron from which he smelted a great deal of iron. It is said that he could not find a stone hard and smooth enough to use as a stithy. To find such a stone he roved to the islands in the Midfirth and dove to find a suitable stone. He found a stone which can still be seen close to cairn no. 5. I could not find it during my visit to this area though, will look harder next time around. It is said to be so heavy that 4 men can scarcely lift it. 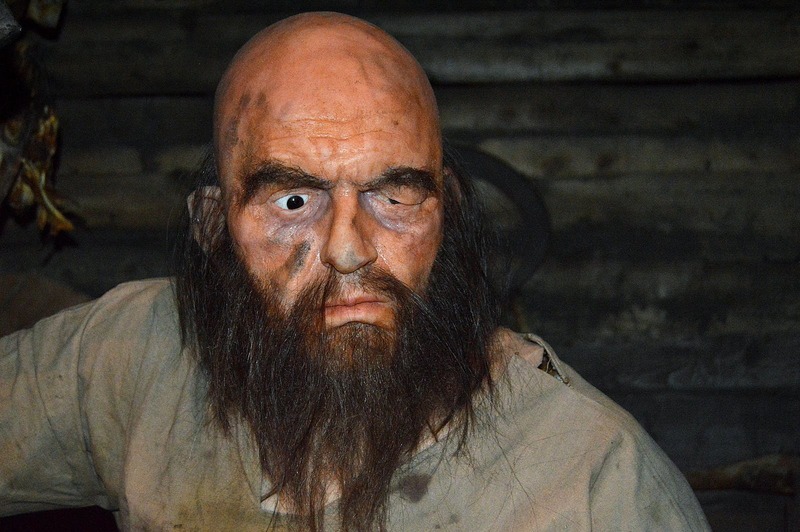 My photo above of Skalla-Grímur Kveldúlfsson I took at the Saga-Museum in Reykjavík, where you can visit very lifelike wax-figures of influential characters in the Icelandic Sagas and other Icelandic stories. Rauðanes is located off road 54, by the end of road 532. At Ánabrekka - Áni Slopes you will find cairn no. 6. Written on it in Icelandic is "Landnámsjörð Áka skipverja Skalla-Gríms" meaning that Áni, a crew-member on board Skalla-Grímur's Viking ship, settled land here. Áni was one of 9 crew-members on board Skalla-Grímur's Viking ship. They were all fleeing the Norwegian king Haraldur hárfagri - Harald Fair Hair, like so many of the settlers of Iceland. The son of Áni was named Ögmundur and he lived at Áni Slopes when Egill Skallarímsson lived at Borg. Egill lost his wife at that time and went to live with his foster daughter at Mosfell. His son, Þorsteinn, took over his father's position at Borg. At the same time Steinar, the son of Önundur took over at Áni Slopes. Steinar repeatedly encroached upon the land of Þorsteinn. This lead to a dispute between these two Viking and is this dispute described in the final chapters of the Saga of Egill. To find cairn no. 6 drive on road 54, along road 533 and to the end of road 534. Cairn no. 7 stands on top of a hill at Einkunnir with a beautiful view of the surrounding area. This is the only cairn where a short hike is needed - all the other cairns are easily accessible and stand by the road. I visited this cairn when I went berry picking at Einkunnir last autumn. 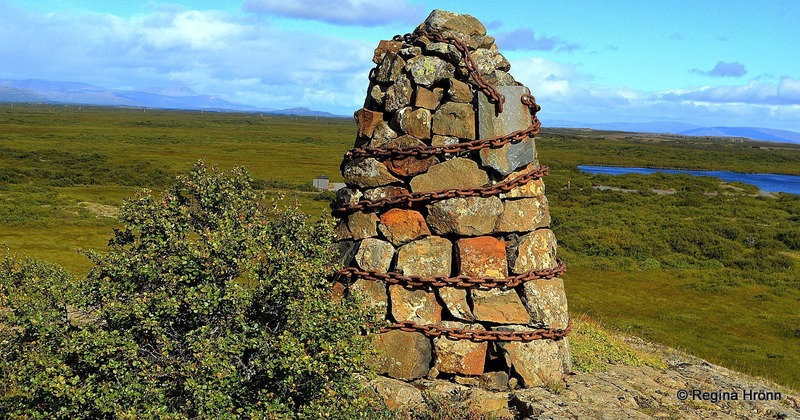 On the cairn is written in Icelandic "Skinu við tólf spjót og skildir nokkurir" meaning, that the shine from 12 spears and some shields could be seen. I found this sentence in the 88th chapter of the Saga of Egill, when Íri told Þorsteinn, the son of Egill Skallagrímsson, that he had walked on top of Einkunnir and looked for sheep, but had also "seen in the wood above the winter road the gleam of 12 spears and some shields". Steinar had apparently waited in ambush with 11 men up on Einkunnir. The 7th cairn used to be located at Álftanes - Swan Peninsula, where Skalla-Grímur had a good hunting ground. There Yngvar, Egill's other grandfather, was offered to live when he settled in Iceland. And it was at the Swan Peninsula that Egill, who had been prohibited to go to a party at his grandfather's place, as he was only 3 at the time, rode alone to the party and composed his first poem. I looked for the cairn at the Swan Peninsula, but the farmer told me that there had been so much traffic through his land that he had had the cairn removed. It is a pity though as it is an important location in the Saga of Egill. But we must respect the wishes of the farmers in Iceland. 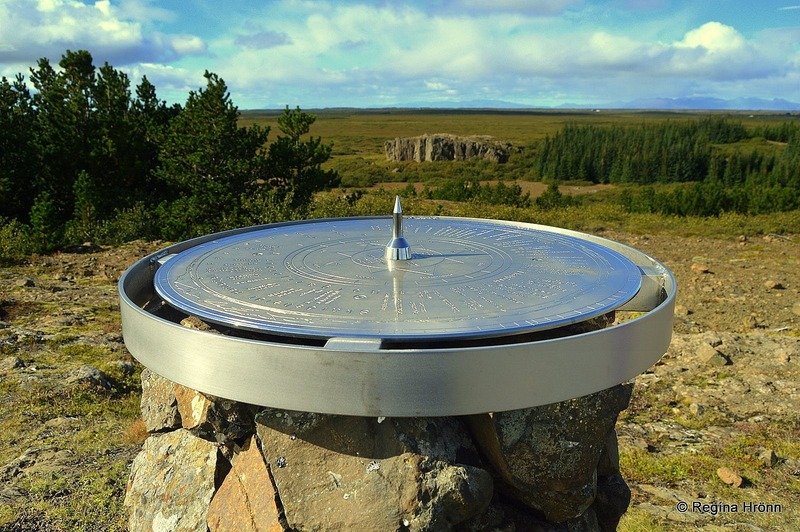 Close to the cairn, you will also find one of the many beautiful view-dials in Iceland. The view-dial at Einkunnir was designed by Jakob Hálfdanarson, my father-in-law. Cairn no. 8 is located at Krumskelda - Krum's Bog and written on it in Icelandic is "Hér liggur silfur Skalla-Gríms" - here lies the silver of Skalla-Grímur! Skalla-Grímur and his son, Egill, were known for being thrifty Vikings. When Egill was in England the king Aðalsteinn gave him a considerable sum of silver to give to Skalla-Grímur. Egill did not give his father the silver and Skalla-Grímur resented this. It is written in Chapter 60 in the Saga of Egill how Skalla-Grímur, on the night before he died, rode into the night with a large copper kettle and a chest. It is believed that he buried his treasures here at Krum's Bog so that Egill would not get hold of them, and covered them with a huge flat stone. 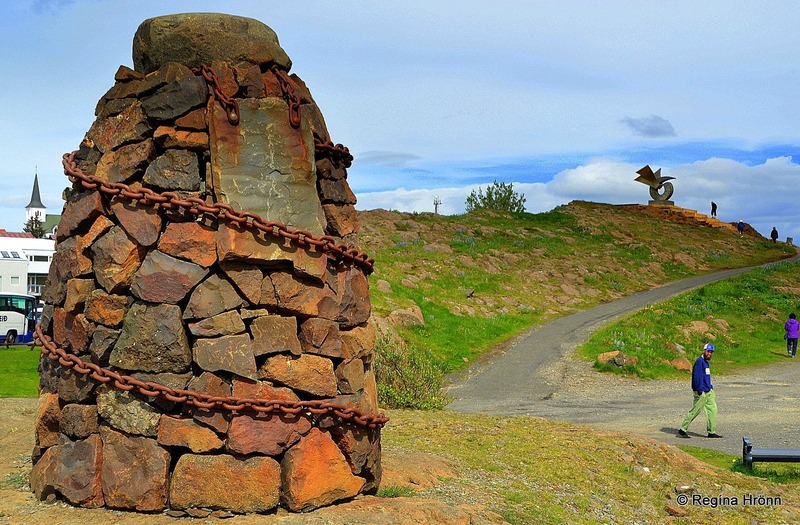 To visit the 8th cairn get off ring-road 1 and drive along road 530. I passed it on my first try to find it, but it is located halfway to Krumshólar. Be on the lookout for it as it is easily passed. The 9th and final cairn stands by Hvítá glacial river on Hvítárvellir - White River Plains. 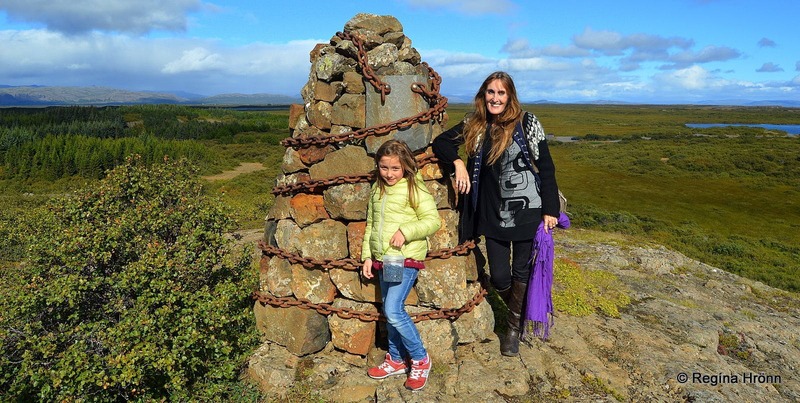 Written on this cairn in Icelandic is "Hér var kaupstefna til forna" - here was a trading market in ancient times. Every summer a popular trading market was held at this location when merchants from Norway sailed in and sold their merchandise. Egill Skallagrímsson grieved deeply for his young son and wrote his most famous poet Sonatorrek - the Lament for my sons. It was also on these plains that Egill killed an 11-year-old boy. It was Egil's first killing - at the age of 7!! The cairn is located by Hvítárbrú bridge along road 53. Kudos to Kjartan and Sigríður at the Settlement Centre for putting so much effort and love into introducing the Saga of Egill to us! I really admire their work and applaud such visionary people in my country, who get an interesting idea and follow it through. 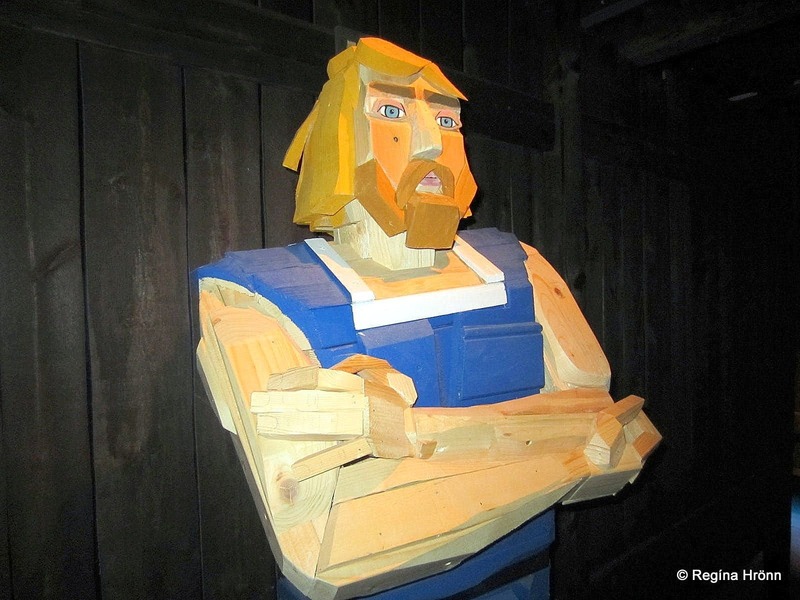 Another entrepreneur like this is Jóhannes Viðar at the Viking Village, who has also put a lot of work and effort into creating a Viking world in Hafnarfjörður town in the Great-Reykjavík area. Borgarnes town is located in West-Iceland, some 74 km away from Reykjavík through Hvalfjarðargöngin - the Whale Bay tunnel. 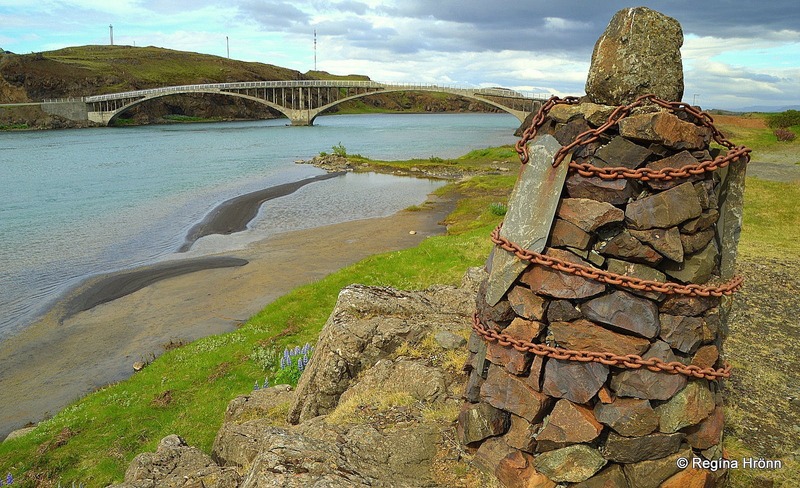 To reach this area you can rent a car in Reykjavík and drive to Borgarnes in an hour. Don't miss the chance of getting acquainted with the Viking Egill Skallagrímsson and visit the Settlement Centre! 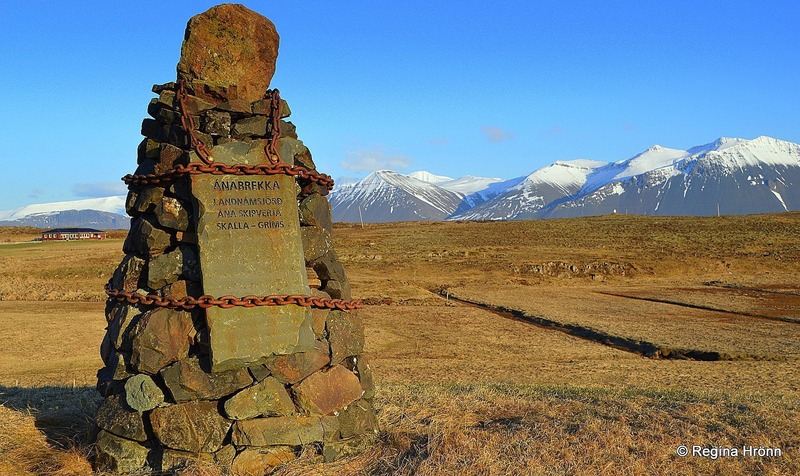 Snæfellsnes peninsula is also close by, and to visit the many interesting sights of the ever so popular peninsula you drive through Borgarnes town and make an immediate turn on road 54.